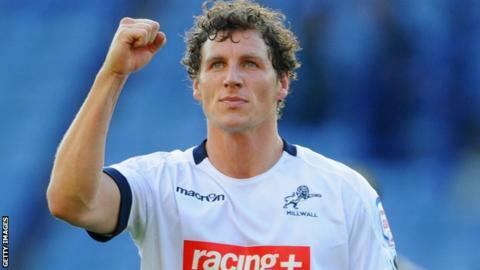 Darius Henderson earned Championship strugglers Millwall a point for the second game running. The striker, who grabbed a late equaliser in Saturday's 2-2 draw at Burnley, levelled after Steve Davies had given Bristol City the lead. Davies, signed from Derby in August, marked his first City start with a 30-yard header that beat David Forde. But despite Henderson's headed goal, Millwall are without a win in five matches and stay in the bottom three. Henderson had passed up a good early chance to score, failing to beat keeper Tom Heaton when well placed after being played through by Liam Trotter. Davies, who had already tried his luck with three long-range efforts, headed Bristol City in front when Forde headed Cole Skuse's through-ball into his path under pressure from Sam Baldock. The equaliser came when Henderson headed home James Henry's cross from the right seven minutes before half-time. Chris Wood almost gave Millwall the lead before the break, but he could not get enough power on his header from Shane Lowry's cross as Heaton easily claimed. Derek McInnes's men had the first chance of the second half when Davies nodded down a Neil Kilkenny cross into the path of Albert Adomah but, off balance, he struck over the bar from close range. Davies then curled a free-kick wide, before hitting the side-netting with a shot from Skuse's delivery. Substitute Andy Keogh glanced a header wide for Millwall with three minutes to go, while Henderson dragged a shot wide in injury time as the visitors ended the game on top. Bristol City manager Derek McInnes: "Millwall battled hard for their point, but we missed two great chances in the second half when Albert Adomah and Steve Davies missed the target. "Had either one of those gone in I think it would have been a different story. But we have to be more resilient when defending crosses." Millwall assistant manager Joe Gallen: "The lads are disappointed. David Forde was unlucky with their goal because he took the right decision to come out. "It was amazing that the ball should drop to their lad with such pace that he was able to generate the power to head it in. "But after that we showed a lot of character, scored a great goal ourselves and defended with a lot of tenacity."